I follow over 100 blogs each week to keep up with my industry, which is WordPress and online marketing. All of those blogs post multiple times a week, and some post up to 20 times a week. In other words, I was a Google Reader power user. There’s no way I could handle that amount of posts via email subscription. The popular alternative has been to switch to Feedly. They jumped on the shutdown news from Google immediately and created a one-click Google Reader Import service. (It took less than a minute to complete my huge import.) And, they also have mobile apps for both Apple and Android devices. Plus, they even created a title-only view that pleased a lot of Google Reader fans, including me. Plus, they already have a more visual view mode that is similar to Flipboard. Back in August, I wrote a post on Google deprecating the FeedBurner API, which sent rumors flying about whether it was a sign that Google would shut down FeedBurner. Those rumors were justified because previously Google had shutdown the Translate API, and the FeedBurner Twitter account, as well as the Adsense for Feeds blog, the last two without warning. So, it looked for all the world like FeedBurner was in a controlled shutdown. Reading the writing on the wall, a lot of folks began promoting alternative means to deliver blog posts to readers, mainly in the form of RSS to Email subscriptions. In fact, it prompted me to create the Ultimate Feedburner Alternatives Guide for RSS and Email resource that you can download for free. Because my Email service of choice is MailChimp, I then created the How to Export FeedBurner Subscribers to MailChimp RSS to Email guide, which you also download. After that, I created an entire MailChimp Video Course that included every step in setting up an RSS to email subscription as either stand-alone or as a segment of an existing list. Yeah, I was that convinced that Feedburner was going bye-bye. And then the news came in March that Google would be shutting down Google Reader. That only gave online marketers a few months to convert their readers. So I immediately got out two posts to encourage that process and help them do it. The first is titled Google Reader Shutdown Heralds the Rise of RSS to Email and G+ Users and the second is titled Promote Your RSS to Email Before Google Reader Shuts Down. If you haven’t started your campaign to encourage more of your subscribers to receive your blog posts via email, you only have one week before Google Reader shuts down. But, if you are sending your subscriptions via Feedburner, it is not shutting down, yet. I still firmly believe that Feedburner will not survive. Google is doing everything it can to get folks on the G+ network. It wants you to follow folks who write great content there. The metrics of +1s and shares Google gathers there is a super way for them to index how popular content is. And, it’s a better indicator than an RSS feed subscriber count ever will be. 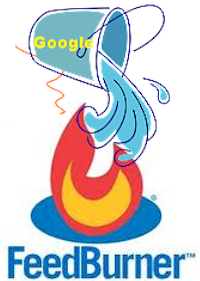 Do you use Google Reader or Feedburner? Have you made any changes to your subscriptions as either a reader or a content creator? I use feedreader currently and am now going to read your other articles to see what your are talking about here. There’s alot to digest. Thanks for your valuable information here. Enjoy the book Michael and thanks for the heads up about the Feedly link. I’ll run fix it. Sure am enjoying that service and don’t miss Google Reader too much.